I think I’ve officially lost track of the weather around here. Afternoons are starting to get warm and sunny, but overnight the temperature still plunges towards freezing, which makes getting dressed in the morning a bit of a challenge. It occurred to me that, you know what? This is exactly the time of year that fingerless mitts are meant for. Some days you need that extra bit of insulation around your hands, only to tuck them away in your purse or pocket later on on the day. On that note, I’m pleased to present the seventh pattern of eight in the Urban Collection (Ravelry link), the Queen St. Mitts. Since I wanted the pattern collection to be versatile both in garments and in yarn selection, I decided to use sock-weight yarn for something that wasn’t socks. After all, many of us are frequently tempted by that single skein of sock yarn purchase in a shop or at a knitter’s fair, and some times you want something to do with it that isn’t socks. At the same time, I was having a hard time putting away the aran-style cables that appear in several other pieces in the collection and thought, you know? Let’s just do that on a pair of mitts. Aran sweater styling in miniature, but with the chance to let loose with some crazy colour, too. 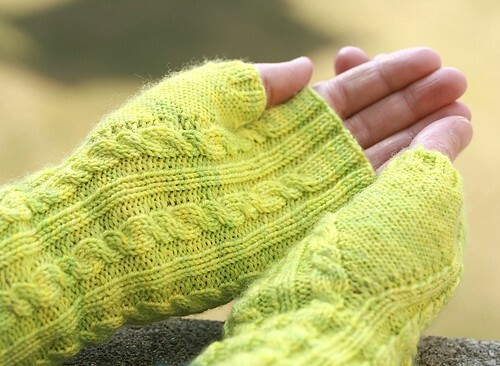 The main pattern along the back of the hand is a spring-like combination of cables, bobbles, and texture, while the palms are more modest with a cable and rib combination. I’m quite pleased with how these turned out, and might have to go back for a second pair in another colour. I enjoy the way fingerless mitts offer a small and relatively quick canvas to explore various techniques – I think you’ll be pleasantly surprised how fast these will knit up – and am going to keep it in mind for future projects. More fingerless mitts, fewer cold hands! Also, it’s fitting that I post about these today, since it’s Tanis‘ birthday, from whom the yarn comes. Have a great day, Tanis! Happy knitting this weekend, everyone! I knit this up as a gift to a friend out of the first skein of TFA Lemongrass lace weight. It looks amazing! I still have plans to knit one up for me! Very nice! I want to make myself some. A show stopping eye-catcher! Looks great! Very nice! You are so talented! Would love to be able to create such knit wonders! Great pattern! And I love the color you choose. 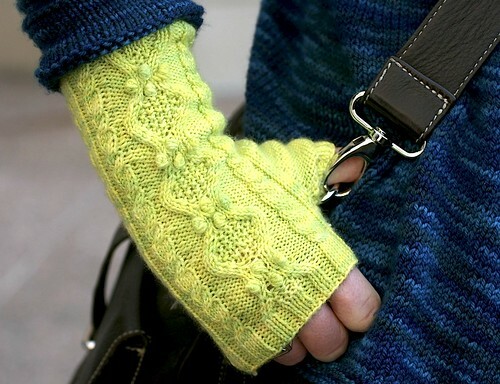 I am very partial to cable and bobble patterns, but I’ve never knit any fingerless gloves – this pattern may be the impetus to get me going. Thanks! Very lovely, and I love the way the cables outline the thumb gusset. Sock yarn for not socks. Perfect! 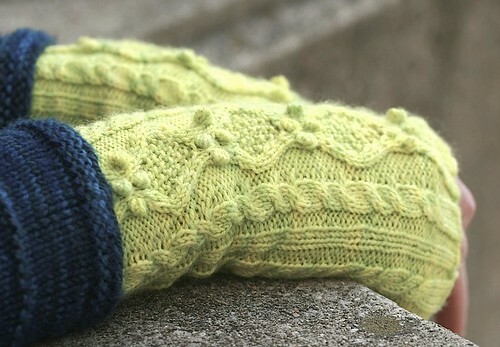 I love that sprite ( lemony-lime) color of the mitts. What a pretty showcase of bobbles and cables, love them! I love the springy look! Hopefully I can get the hang of these. Sure am going to try. They look so beautiful and I have just the sock yarn that would do them justice. Hi, I absolutely love these. When I was in my uni years we all knit coloured Aran sweaters. I made a gorgeous sky blue one and looking at these takes me back. But, what I really want to know is, what is that beautiful yarn in the sweater/jacket in the background? They are lovely. And I love that colour too. I used it for my latest Twist Collective offering which is a full sweater- so now you can see what a whole sweater would look like- a great look for spring!